This past weekend was a blast. I was hosting my painting group in my home town of Grapevine, Tx. We had a real good attendance that included several new members and several signature members showing up to get their paint on. I was a little nervous and prayed the outing would go fine. We had a forty percent chance of rain in the forecast, but we made it through the day with only one ten minute downpour that didn't stop anyone. Several really nice paintings where done and even with all the talking and direction giving I managed to paint three paintings. I'll show some pictures of the outing in some upcoming posts. 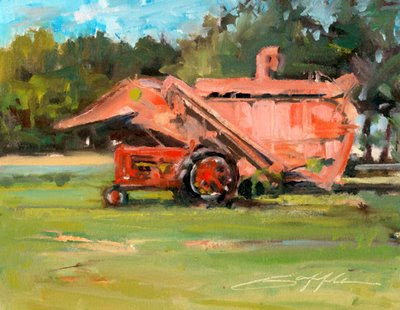 The "Pink Anteater" is a painting of some vintage farming equipment on a farm only one block from my house. My family drives by it all the time and my boys always remark how much the old bailing machine looks like an some kind of strange animal, compete with green eyes and weird smile. I've wanted to paint this scene for some time. I was in luck that day because a red tractor was left right next to the bailer. In my eyes painting both of these together not only tells the viewer what this machine is used for but also just how large it is. This was very fun to paint and my boys got a kick out of it too. Your best painting to date. This painting shows some real growth in your work and the recognition that you are becoming comfortable painting plein air. Great piece. Keep up the good work. Lee, thanks for the comments. I had some good advice from that days painting partner, Bob Rohm. He told me to keep the foreground loose and not real detailed because the subject was so detailed. Made sense to me. Thanks Rusty! Taking your workshop, watching you give several demos and just generally looking over your shoulder is starting to pay off. I have been really working at it lately and comments like that help me keep the fire going. I’m really enjoying seeing more of your work lately also. This Blog thing is helping us both chart our progress. I appreciate your comments. Let me know if you see me post something you don’t like too. Keep me honest. So glad y'all had a great weekend! I would have loved to come, but our local group was having it's own annual trip - to Granbury! We were not too far away. This painting turned out fabulously! You have an open invitation to paint with me in Grapevine anytime. Bring your local group!